With the end of another year already in sight, we’re taking a quick look at some other 2015 releases we just couldn’t let go unacknowledged, including these latest offerings from both one of the blues’ most established acts as well as its biggest rising stars! If it’s an acoustic blues party you’re seeking, you’ve come to the right place. A follow-up of sorts to the band’s 2010, Blues Music Award-winning Last Train to Bluesville, the always-entertaining The Nighthawks are back with another damn good time on the live, acoustic Back Porch Party, featuring a dozen lively originals and covers that nicely showcase the band’s rich sound, from the breezy swing of the opening “Rock This House” to the rockabilly “Jana Lea” and creeping country of “Walkin’ After Midnight” to the familiar blues of Muddy Waters on both “Tiger in Your Tank” and “Rollin’ Stone”. It’s all good, of course, but the tracks that stand out most for us here are probably two that feature the band’s “newest” member – drummer Mark Stutso, who joined The Nighthawks back in early 2010 – on vocals, a shuffling take on the blues classic “Matchbox” and the soulful, Norm Nardini co-written “Down to My Last Million Tears”, as well as the swinging country jazz of the album’s closing “Back to the City”, which includes some delightful stop-time playing from lead vocalist Mark Wenner on harmonica over Johnny Castle’s bass. 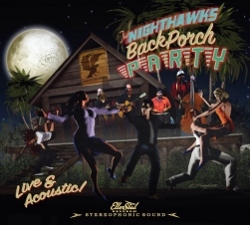 Along the way, there’s also the band’s creeping take on Tom Waits’ “Down in the Hole”, the uptempo boogie of “Hey Miss Hey”, and the straight-ahead blues of Otis Hicks’ “Rooster Blues” (Lightnin’ Slim), making this one Back Porch Party you won’t want to miss! Perhaps best-known as one of the voices of blues supergroup The Mannish Boys, multi-Blues Music Award nominee Sugaray Rayford has been making quite a name for himself in recent years through solo projects such as 2013’s Dangerous and, now, Southside, a sometimes soothing (check out the smooth R&B grooves of “Live to Love Again” and “Call Off the Mission”), sometimes scorching (try “Texas Bluesman” on for size) blend of soul and blues that again proves Rayford to be one of the most versatile – and absolute best voices – in the blues today. In between the jazzy, swaying R&B soul of the opening “Southside of Town” and crawling, seductive blues of the closing “Slow Motion”, you’ll also hear the powerful vocals of songs like the gritty “Miss Thang” – with lyrics such as “she rocks like an old fishin’ boat, baby, in a very, very, very rough sea/ I like it when you walk into me, baby/ I love it when you turn and walk away” – and the aforementioned “Texas Bluesman” that begins on a booming “six foot five, 300 pounds… I come all the way from Texas, baby, just to sing the blues for you” before Rayford proceeds to remind us of some of the many other blues greats who have hailed from the Lone Star State, including Freddie King, Lightnin’ Hopkins, Blind Lemon Jefferson, Albert Collins, Stevie Ray Vaughan, and T-Bone Walker, accompanied by some stinging Texas-style guitar from Gino Matteo. Rayford’s hearty laugh can be heard throughout the album, particularly on the funky R&B soul number “All I Think About” with its Ironing Board Sam-like keyboards, some of the most passionate – and even, on occasion, squeaking – vocals Rayford has to offer, and horns and female backing vocals, and on the boisterous, down-home blues acoustic sit-down “Take It to the Bank” featuring Bob Corritore on harmonica. 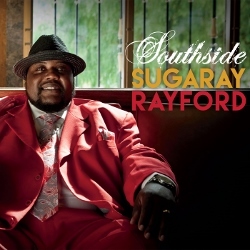 All nine songs here are Rayford originals, although “Live to Love Again” could easily be mistaken for a cover of a 70s or 80s R&B hit, while the dark, swaying “Take Away These Blues” – with its slow surf-style riffs – sounds like something that might have been lifted from a Tarantino soundtrack, demonstrating that Rayford is capable of going in a multitude of directions. As highly entertaining and superb as this one is, and following Rayford’s earlier Dangerous, there’s no question that one of those directions is up! This entry was posted in Albums and tagged Sugaray Rayford, The Nighthawks. Bookmark the permalink.